Since it was also a fine time to go get breakfast, we headed over to The Original Pancake House; but not after stopping in at the Great Harvest Bread Company and picking up some cheesy jalapeno bread, a Turtle Cookie, and some pumpkin loaf with chocolate chips in it. Clearly we’re fattening up — more — for the winter, months down the line. Fast forward to our food arriving at The Original Pancake House, a place which prides itself on the quality of the food it serves. Before our food arrived, I was already impressed with the fact that they brewed their own coffee and served me a small cream pitcher filled with…cream. I don’t know about you but perfect coffee with your breakfast is kind of like what vanilla does to sugar cookies: you would only appreciate it in its absence. And it’s that important. 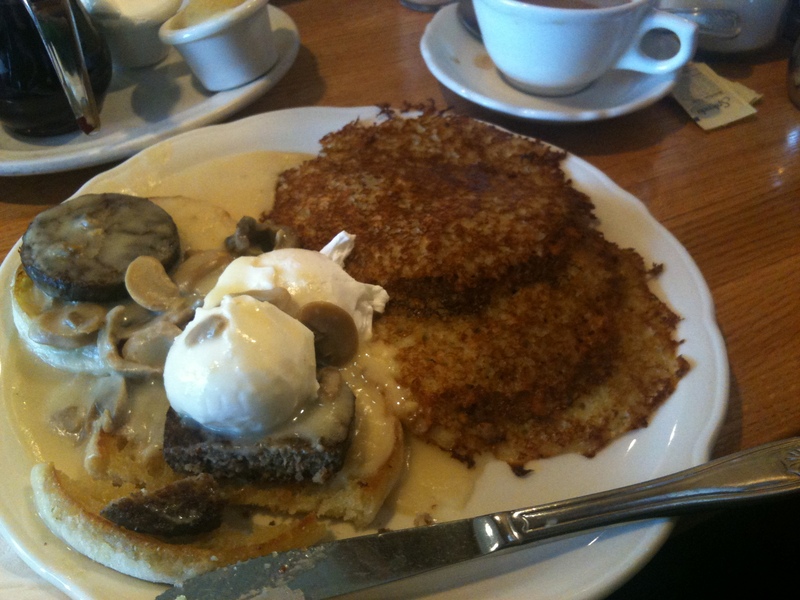 I decided to order Eggs Michael, a dish consisting of two poached eggs on top of some sausage and English muffins, topped with a mushroom sherry sauce and served with three potato pancakes, which come with sides of sour cream and apple sauce. Does that not sound amazing? I’m posting some photos of our meal, in case you need incentive to visit the Champaign-Urbana area and try this place out for yourself. (Click on each to see an enlarged view.) We split a plain waffle because the place is famous for its waffles and pancakes (and they have a huge variety) and it was absolutely delicious. You can tell these people take pride in what they serve to their customers. It was a bon repas, indeed. After reading that, I feel compelled to come to Champaign-Urbana. So much so that I’ve booked a flight for next weekend. I gained so much weight just reading and looking at that, they charged me a surcharge. Just lettin’ ya know. 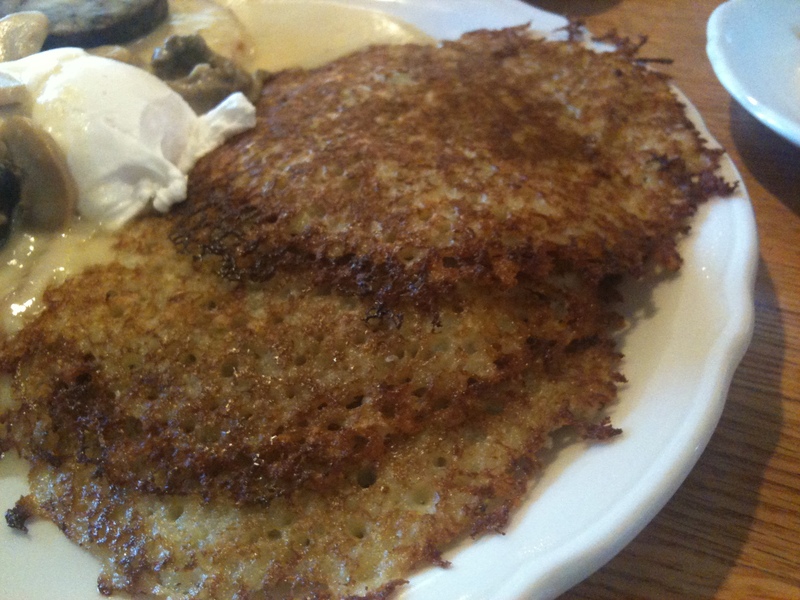 See, I don’t think eggs and potato pancakes are all that bad. 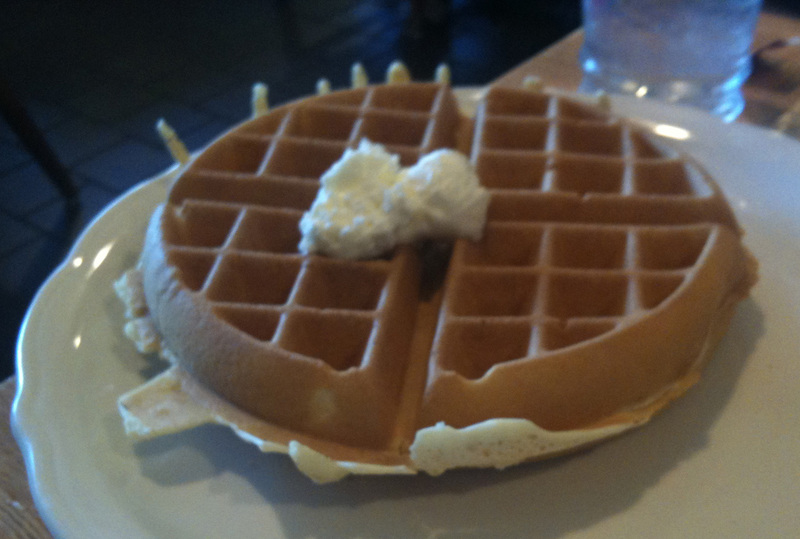 I mean, the waffle with butter and syrup I can understand. I’m sure it was more caloric than I think. Can’t wait to have you in the C-U! Kevin, if memory serves, you already make awesome shredded potatoes. I think it’s only one step further to making the pancakes but the shredded potatoes are pretty brilliant. Found your blog through your Coffee Fool post, and I live in Champaign. I guess that’s not the strangest thing ever, but it explains why so many places you mentioned sounded familiar. I think I’ll try Coffee Fool soon. Thanks. Leaning toward Hawaiian Kauai and Indian Mysore. Will let you know how that works out. I love Great Harvest! Used to eat their at least twice a week back in the days. I’ll have to make it a habit again. I haven’t been there in a while but you’ve reminded me to go again!